A man diagnosed with Parkinson’s disease began a cross-country walk two months ago to raise awareness of the disease, and finished his last mile at the San Diego Imperial Beach Pier on Wednesday. Along the way, Bill Bucklew of Wilmette, Illinois, visited other patients with the disease, caregivers and people working to support the fight for a cure, according to his non-profit organization, Uncorked Adventures. Bucklew walked 2,503 miles from start to finish and raised over $90,000 for his organization, in partnership with Team Fox of the Michael J. Fox foundation for Parkinson’s Research. Bucklew was 43 when he was diagnosed with Parkinson’s Disease in 2012, and has been working to inspire those affected with the disease since then, according to his website. 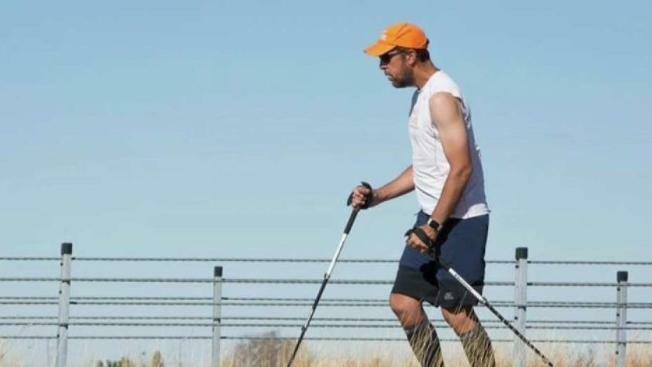 On November 24, he began his walk across the U.S. from Tybee Island, Georgia, and crossed the U.S. at an average of about 40 miles a day, or 1.5 marathons daily. On his final day, Bucklew was joined with over 50 friends and family members to complete the last mile, from Veteran’s Park to the Imperial Beach Pier, and to celebrate the completion of his journey. "My message is I'm out here, I'm living with Parkinson's, I can walk across America, doing amazing things," said Bucklew. "We can all do amazing things--what's your path? Find your path and put your heart into it." Bucklew finished his last step across the U.S. with a cold dip in the Pacific Ocean, fully clothed. Bucklew’s organization is dedicated to finding a cure for Parkinson’s disease, inspiring those affected, and educating those who are not, according to Uncorked Adventures. He previously participated in athletic events, such as triathlons, to raise money for Parkinson’s research.